After a 3 hour flight from Perth we were transported into a tropical paradise. The first thing that strikes you as you step out of the plane is the heat, or strictly speaking the humidity. It’s “only” 30C but with 80% humidity it feels like you’re in a steam room and you’re sweating just lying down without doing anything. Getting to our backpackers hotel was such an effort that we slept for the next 3 hours and only woke up for dinner. 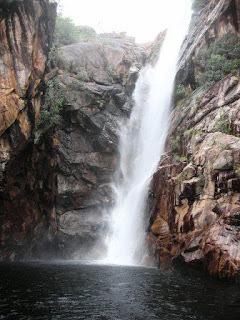 The next day was the start of our 3 day organized trip to the Kakadu National Park. Kakadu National Park is the largest national park in Australia, covering 20,000 square kilometers, and includes the traditional lands of a number of Aboriginal clan groups. It is jointly managed by traditional owners and the Australian Government and uniquely for Australia has been listed on the World Heritage List both for it’s natural beauty and cultural heritage. 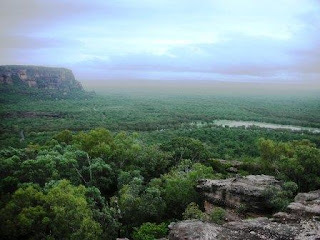 The name Kakadu comes from the Aboriginal floodplain language called Gagudju. 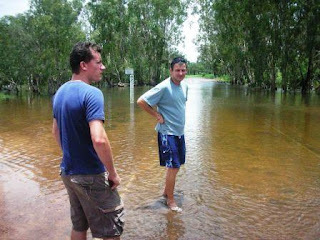 It’s a 250km drive from Darwin to Kakadu and our first stop on the way was Adelaide River where a boat was waiting for us to take us on a cruise of the crocodile infested river. 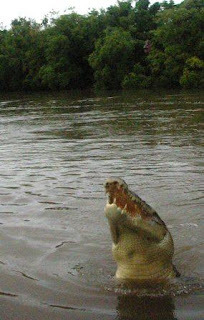 There are 2 species of crocodiles that inhabit this area: a freshwater crocodile, which is quite timid and will only attack if provoked and the estuarine (saltwater) crocodile which can be found in both fresh and salt water and is very aggressive. 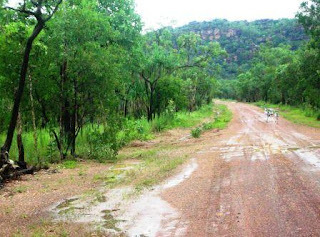 The period from October to March is the wet season in Kakadu and many of the areas and access roads are flooded and sometimes inaccessible even with a 4WD. Luckily the water level on the access road to Ubirr was only 0.8 m and we were able to get through. The art sites of Kakadu are one of the greatest collections of ancient art accessible to the public in Australia and Ubirr in the South Aligator Area is one of the major of over 500 known art sites within the park. 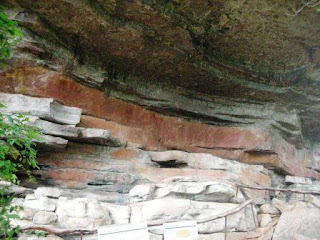 The rock art is typically present at sites that have been used as shelters, either permanent or temporary, preventing them from the effects of the weather. Aboriginal people have a very strong connection with the land, which according to their believes was given to them by their ancestors - the spirits who came and created the land with it's all features and animals. Aboriginal people are custodians of the land, the law and the stories that go with it. The Mimi spirits were the spirits who taught the Aboriginal people to paint. 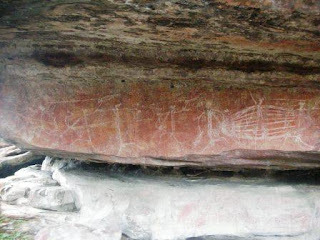 Different styles of rock art are represented at Ubirr. 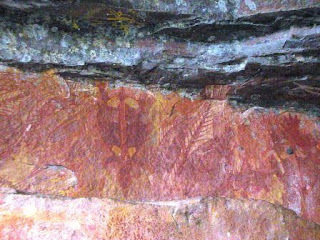 There are relatively simple ochre paintings, which are believed to be amongst the oldest paintings, x-ray paintings showing the internal structure of animals and contact art marking the arrival of non Aboriginal people. The paintings can not be dated exactly, however studies of the environmental changes reflected in the art suggest that some paintings can be 20,000 to 50,000 years old making them some of the oldest on earth. 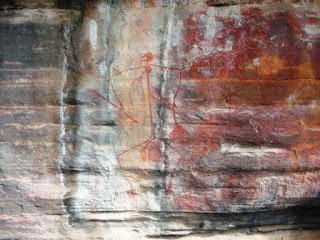 The Aboriginal rock paintings often reflected events form the Aboriginal life, stories that were taught to children, like the war story below, or represented food objects - above. An Aboriginal warroir carrying fighting equipment, spears and perhaps a shield. 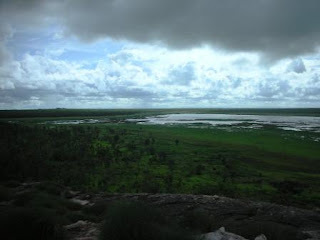 The view from the 250 meters high lookout at Ubirr shows the typical Kakadu floodplains landscape. After lunch we headed South to the Mary River Area for an overnight stop at Mary River Roadhouse. In the morning the next day we continued exploring the area and went for an easy trek to the Yormikmik Falls where we had the opportunity for a swim. The drive back though the floodplains to the Yellow Water area was again spectacular. This area is known to the Aboriginal people as the “sickness area” and is a sacred place. Entering this area was forbidden it it was believed that if a person cut his foot on a rock it would not heal and he could die. Coincidentally this area is also rich in radioactive uranium, which perhaps may be linked with the notion of the "sickness area". After an overnight camp at the Mardugal camp site we drove to the Nourlangie Area for a walk to another spectacular lookout with a view of the park and a rare occasion to see the timid Black Wallaroo. 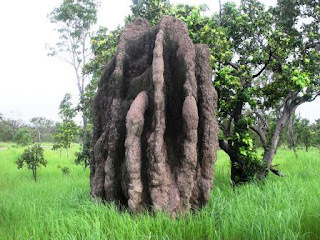 After lunch at yet another waterfall and a swim it was time for the long drive back to Darwin stopping on the way to see some giant termite mounds. The Kakadu National Park trip was a great experience, but unexpectedly more on the cultural side than the nature. For the first time we were exposed to the Aborginal and our guides were very knowledgeable and passionate about the culture, which made it a memorable experience for us.